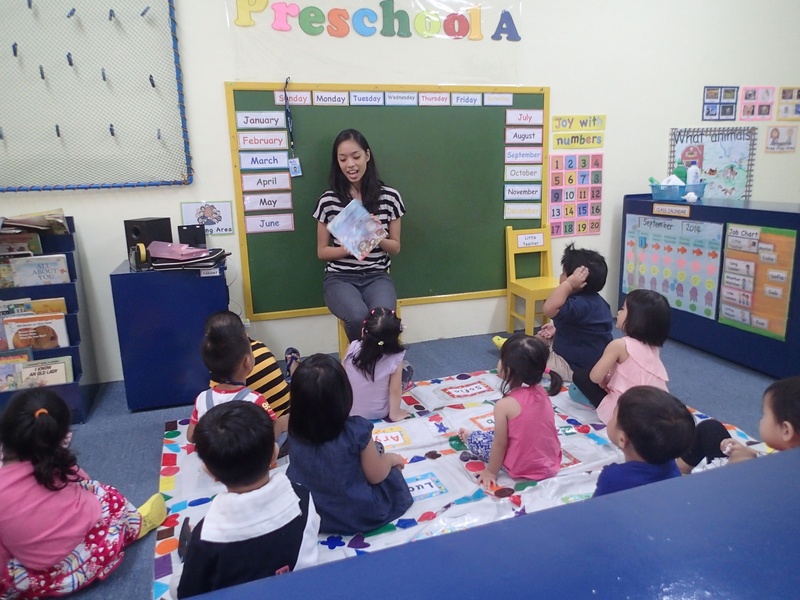 Routines of the Progressive Preschool Class: Circle Time – What is a Progressive School? "My child didn't pass the school's admission test!" After Free Play, the teacher calls everyone in a progressive preschool class to sit together, usually in front of the blackboard for Circle Time or Meeting Time. An important part of the routine is the transition from Free Play to Circle Time. Because the students have been playing with the learning materials in Free Play, there’s a need to clean up before Circle Time. The teacher usually sings a clean up song to encourage the children to clean up. Transitions are essential to cue the children that the next routine is about to begin. One of my favorite transitions in my class was unrolling the meeting mat. I made a plastic mat with shapes on it and I would ceremoniously unroll it for meeting time. The children will hurrily clean up just to help me unroll the mat and sit on their choice of shape. For older kids, I would put their names on the shapes. 3. It is a ___ day. 5. We will paint today. 1. Today is __ onday. The children learned all these with much fun and little anxiety! The teacher has an empty teacher-made calendar beside her. For younger kids, number are prepared and the children stick each number on the empty calendar depending on what date it is. The teacher counts with the children until they learn what the next number is. Then the teacher asks a child to write the number on the board. Creative songs can be sung for the children to remember numbers like “We write 1 and we write 0 (3x) that’s how we write number 10”. Progressive school teachers are very creative song writers! 3. It is a __ day. The teacher asks a student to peek through the window and see what the weather is. She then sings a weather song like Barney’s “Mr. Sun” if it is a sunny day. She asks a student to either draw the sun on the blank space on the board or write the word sunny. I spell out “sunny” by singing it in the tune of the Bingo song “There was a day when it was hot and sunny was the weather, S-U-N-N-Y (3x), and sunny was the weather” while the children clap out each letter. What did the child learn? 4. There are ___ boys and ___ girls. The teacher asks the boys to stand up and sings a counting song. After finding out the number of boys are present, she asks a student to write that number beside the word Boys. She does the same with the girls. She then asks the students to add the boys and girls by counting everyone in the class to find out how many children are present. What do they learn from this sentence? 5. We are painting today. Routines are laid out for the child to be able to predict what’s going to happen next. Why? Because it what makes them more secure with their surroundings. Parents usually jump to the conclusion that simple activities like these have little educational value. But check out how many concepts the children learned. Circle Time is also Storytelling Time, Sharing Time and Showing Time. Imagine how much they learn by joining the circle! Posted on February 1, 2009 March 16, 2015 by teachertinazamora	This entry was posted in Routines, temporal environment. Bookmark the permalink. ← Scouting for a School Series (SSS): Who is the Teacher? I love your use of B-I-N-G-O song. Your students will learn to differentiate between vowel and consonant speech sounds, as well as sound-spellings! Clever! Wow, Mommy Nikka! This video blew me away! So true so true… thanks for this blessing of a video! could you possibly discuss what children learn during water play, sand play and playing with blocks? traditional parents always question these activities…. thanks ! Pingback: Routines of the Progressive Preschool Class: Activity Time « What is a Progressive School? Hi Carol! THere’s definitely more story telling, songs and sharing than just talking about the Days of the Week, etc. This post only shows that even the Days of the Week can be taught through song too and in a fun way as any lesson can be taught. Pingback: Planning you child’s SPACE and TIME | What is a Progressive School?